I just realized I haven't shown you any of Fabergé's flower creations yet! 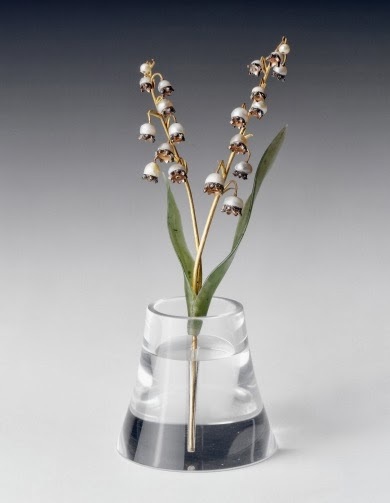 He made many of these, and thought it fitting to start with my favorite flower - Lily of the Valley - made around the year 1899! The delicate bell-shaped flowers are made of pearls, edged with tiny rose diamonds. They are attached to stems of gold, on which also sits a pair of Siberian nephrite leaves. The whole creation rests in a vase made out of rock crystal, carved to resemble a water-filled glass vase. I had no idea that they had flower related Faberge items, really cool and I'm very pleased you've shown us these, thank you Miss Meadows.